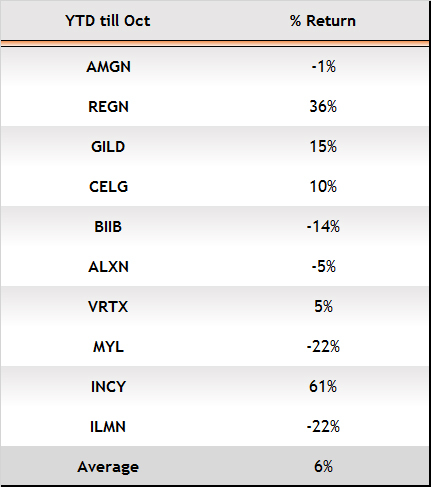 Biotech Stocks Can’t Be Ignored! Since the Great Recession, markets have surged with the SPY ETF, representing the S&P500, recording a rise of 165% for the period January 2009 to October 2015. Over the same time, of approximately 7-years, the IBB, a biotech ETF tracking the Nasdaq Biotech Index, posted a nearly 365% rise. Expanding the timeline to incorporate more than a complete economic cycle, a study of almost a 13-year period from January 2003 to October 2015, once again delivered a similar outcome. 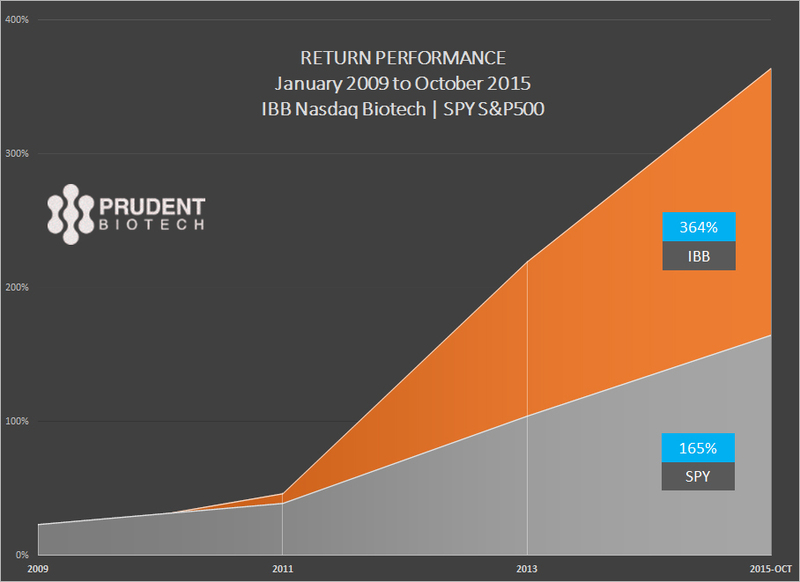 The Biotech sector outperformed the broader market index significantly, rising over 570% compared to S&P500 performance of 203%. The additional performance of the IBB biotech sector, or the sector alpha, of nearly 200% and 370% over a 7-year and 12-year period, respectively, should be understood in the context of risk assumed. 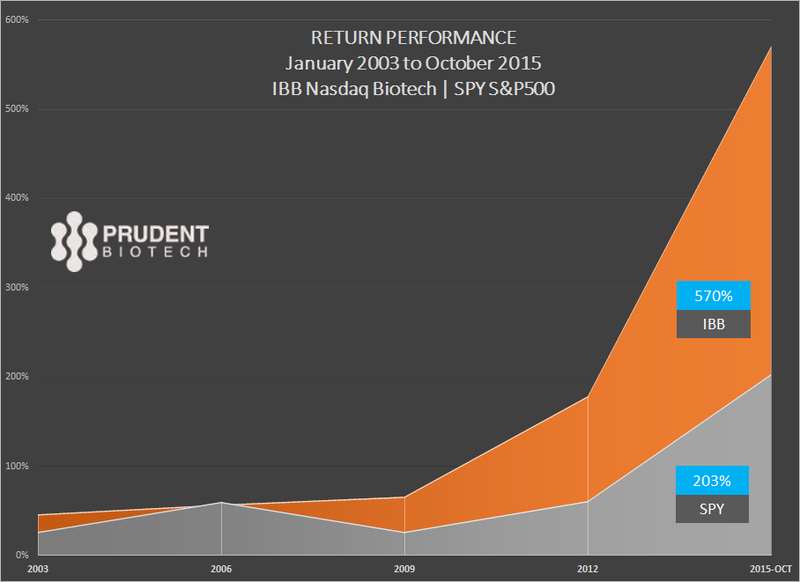 The biotech sector is highly volatile, while the S&P500 represents a much more industry-diversified portfolio. A substantial portion of the volatility in Biotech is due to the binary nature of the sector, heavily influenced by the outcomes of trials in various phases and the FDA decision process. The volatility is typically measured by a return dispersion measure like the standard deviation or SD. The higher the SD, the greater the dispersion or volatility. IBB volatility is higher than S&P500 by about 1.4x, and at the same time its returns are higher by about 2.5x. However, volatility by itself is an incomplete risk measure, since it doesn't provide the risk-adjusted return performance. There are many industry standard ratios like Sharpe, Treynor, Information, Sortino, and Jensen's measure, amongst others, that measure risk-adjusted returns with different variations. Using the widely usedSharpe ratio provides us with a helpful insight. The Sharpe ratio is a relative measure useful in comparing portfolios or funds, and it is desirable to have a higher Sharpe ratio as it indicates a higher risk-adjusted return. The Sharpe ratio in the table above shows a mostly better or similar risk-adjusted return performance for the IBB portfolio over different periods compared to an S&P 500 portfolio. The Sharpe ratio is just one risk-adjusted measure, and over long periods it tends to smooth results. However, it is an effective and standard relative measure and can be supplemented with other ratios based on the objectives of the investment manager. The volatility of the Biotech sector often keeps investors away from the sector. But looking at risk-adjusted returns, such investors may be foregoing additional returns achieved through adding sector exposure to their portfolio. Just using volatility as a guide can cost a portfolio meaningful returns over medium-term and long-term. In 2015, the IBB index as of October 2015 was up 7%, compared to S&P500 performance of 1%. 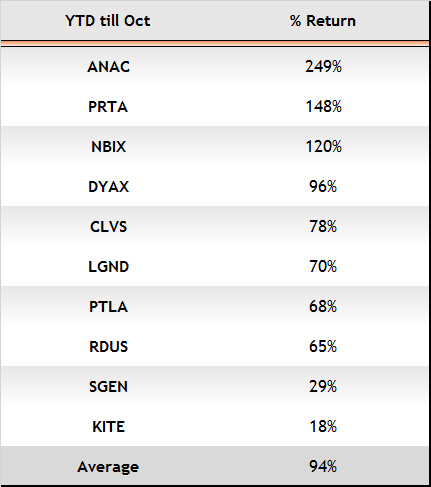 The average performance of the top ten weighted IBB biotech companies during this period has been a little below the IBB performance of 7%. A meaningful portion of the total return performance of IBB for the period has been contributed by small cap and SMID biotech companies. Here's a list of a few such SMID companies with a market cap of mostly between $1 and $5 billion. The list is not a suggestion that there are no negative returns or blow-ups in small and mid-cap segments. The stellar performance of the biotech sector has been driven by a golden period of new drug discoveries, aided by a strong funding market, a healthy risk-appetite, and resulting multiple expansion. The merger of computing power and novel technical approaches to drug discovery has unleashed innovation that has led to new methodologies and cures to target diseases. The biotech sector does get buffeted with its scandals, congressional inquiries, and political rhetoric, due to the sector's position at the core of the healthcare system. Nonetheless these are sector risks that have existed for a long time and are typically transient or seasonal. The sector's vibrancy is eventually determined by the drugs and cures that come to market. With the ever changing envelope of technology and its fusion with bioscience, the potential remains enormous. Any prudent exposure to biotech has to pursue a portfolio approach, for there will always be instances of event related volatility or blow-ups. A portfolio rather than a single stock investment offers relatively more protection. Market corrections and sector disenchantment are events that will always appear in a market cycle. There are times when a prudent move is to exit the sector, and individual investors can benefit from the ease of shifting their portfolio into cash during times of market stress. The Buy-and-Hold strategy doesn't always work in Biotech, particularly in small-caps and mid-caps, for there are too many instances of companies fading away and becoming extinct, more so one would believe than almost any other industry sector. The article is a presentation of evidence that biotech outperforms the broader market consistently over medium-and-long-terms. Using this insight, predicated on factual data, an individual investor should not let the volatility turn them away, but have greater confidence in prudently adding Biotech exposure, which can take the form of an ETF or a portfolio of ideas. 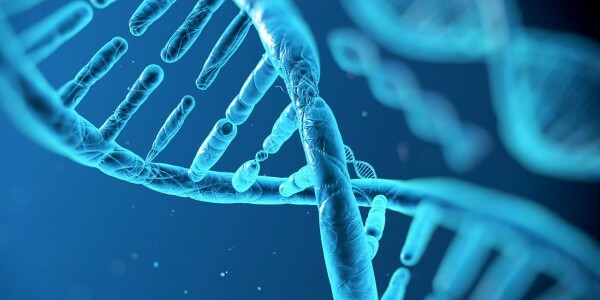 The bottom-line is that the Biotech sector can't be ignored in a portfolio aiming to beat the broader market performance, as it offers compelling risk-adjusted return opportunities.